PARA ODONTOLOGOS GENERALES Y ESPECIALISTAS. EN OCTUBRE EL MASTER DE TERAPIAS MANUALES, PARA TODAS LAS CIENCIAS DE LA SALUD, MASTER ITINERANTE PARA EUROPA. ASIA Y AMERICA . 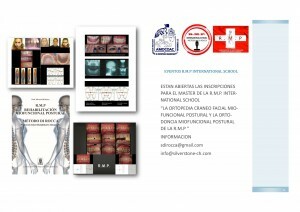 SERA ON LINE Y PRESENCIAL CON PROFESORES DE FAMA INTERNATIONAL EN EL CAMPO . You are currently browsing the R.M.P(Rehabilitación Miofuncional Postural)MètodoDi Rocca blog archives for May, 2016.